Create the perfect seating area in your home with this loveseat. Comfortable and casual, you will be glad to sink into this love seat after a long day to let your stress melt away, especially with the smooth and relaxing rocking mechanism. A deep seat, gently rolled arms and a traditional skirt maintain the relaxed style of the collection. Comfortable and casual, this upholstered sofa will tempt you to kick up your feet and relax with your family and friends. The perfect addition to your living room, den, family room or entertainment space, the casually styled rocking love seat is sure to become the best seat in your house. 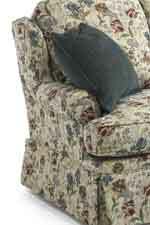 The Danville Rocking Love Seat by Flexsteel at AHFA in the area. Product availability may vary. Contact us for the most current availability on this product. The Danville collection is a great option if you are looking for Casual furniture in the area.